264 pages | 41 B/W Illus. The farming of animals for meat and milk confronts a stark dilemma. While world demand from a growing and more affluent human population is increasing rapidly, there are strong counter-arguments that we should eat less meat and pay more attention to environmental protection, animal welfare and human health and well-being. The aim of this book is to identify and explain the causes and contributors to current problems in animal husbandry, especially those related to 'factory farming', and advance arguments that may contribute to its successful re-orientation. Husbandry is considered in its broadest sense, namely the productive and sustainable use of the land for the good of all (plants, humans and other animals). The first part of the book outlines principles and arguments necessary to engage with current problems: depletion of natural resources and destruction of environment, animal welfare, food and health, fair trade and sharing resources. These arguments are illustrated by examples and sufficient evidence to justify the argument without obscuring the message. 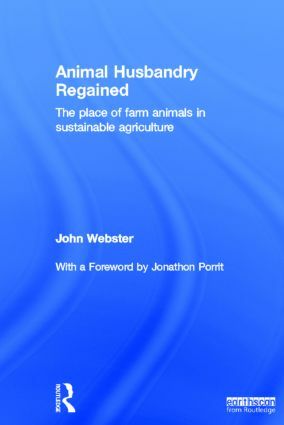 The second part presents a series of constructive proposals for change and development in animal husbandry, both in the developed world and subsistence agriculture. These include more integrated crop and livestock farming systems, the ethics of animal welfare and environmental management, and the evolution of a new social contract whereby the rights of the people to a fair share of good, safe food and a green and pleasant land are matched by a shared responsibility to preserve these things. Part 1: Engaging with the Problems. 1. Whatever Happened to Husbandry? 2. Audits of Animals in Agriculture. 3. Animal Husbandry, Health and Welfare. 4. Food from Animals. 5. Nature’s Social Union: Philosophy, Politics and Economics. Part 2: Embarking on Solutions. 6. Better, Kinder Food. 7. Futures for Animal Science and Technology. 8. Futures for Farm Animals in Planet Husbandry. 9. Animal Husbandry and Society: Substance and Shadows, Carrots and Sticks. Index. John Webster is Professor Emeritus at the University of Bristol (UK) and a former member of the Animal Health and Welfare Panel of the European Food Safety Agency. As Professor of Animal Husbandry at the University of Bristol Veterinary School, he established a unit for the study of animal welfare and behaviour, now the largest such group in the world. He is author of 'Animal Welfare: A Cool Eye toward Eden' (1993) and 'Animal Welfare: Limping towards Eden' (2005), both Blackwell. He is also co-editor of 'The Meat Crisis' (Earthscan, 2010).